When treasure from the bottom of the sea is combined with numismatic sleuthing, collectors are presented with opportunities they’ve never had before. Specimens of the 1861-O half dollar struck during all three periods of operation – federal, State of Louisiana and Confederate control – are being sold by Odyssey Marine Exploration. This was made possible by the discovery of the wreck of the S.S. Republic in 2003, which sank off the East Coast in 1865 in a hurricane. Among the 51,000 gold and silver coins recovered from the wreck by Odyssey were enough 1861-O half dollars to allow Randall E. Wiley to trace a total of 14 die pairings used through the three administrations. 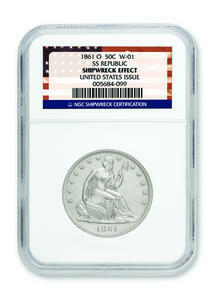 A 15th pairing, that of the Seated Liberty obverse with a Confederate half dollar reverse, was not found in the wreck. A total of six obverse and six reverse dies were used. Wiley published his findings in the November Gobrecht Journal and Numismatic Guaranty Corp. has used the research to slab the 1861-O half dollars and attribute them to the federal, state or Confederate periods. Odyssey now is selling them. Collectors who want to buy a three-coin set with one from each governmental period can obtain a set for $6,940. The firm did not specify what grades these coins would be, but said better grades would cost more. To buy an 1861-O half struck by Louisiana, which produced the most coins, prices start at $1,495. Of the 2,532,633 1861-O coins struck, 330,000 were struck during federal control, 1,240,000 during state control and 962,633 during Confederate control. For more information, or to order, telephone toll-free (800) 575-6468. Or visit the firm’s Web site at www.shipwreck.net.